Ed. note: The job has never been easy, and it’s about to get a lot harder. When the Feds make moves, as they did over the weekend with a poorly planned and executed executive order on illegal immigration, it’s almost always the cops (as opposed to the feds or the administration) under the bright glare of the television cameras and microphones. This being the case, it’s always a good idea to figure out what to say before people ask the questions. 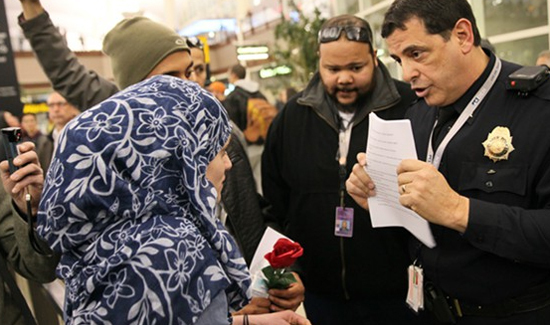 Denverite reported that over 200 people gathered at the Denver International Airport on Friday to protest President Donald Trump’s executive order banning travel from seven majority-Muslim countries. In video posted to YouTube, Police Commander Tony Lopez can be seen advising demonstrators that they are in violation of the law. “Stop doing anything that could be construed as free speech without a permit,” he explains. Lopez warns in the video, which lacks context, that even carrying a copy of the U.S. Constitution was prohibited in the airport. “I cannot carry the Constitution without a permit?” one protester asks.